Olives are a favorite finger food in my house. 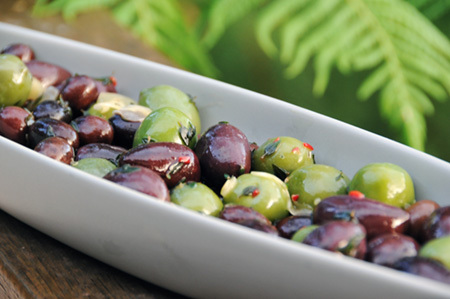 Open a simple can of black pitted olives and there is little time to put what you need in a recipe. Under secrecy this recipe must be prepared to give it time to marinate, the results are worth it. In a saucepan of boiling water blanch the black & green olives for 1 minute, drain them, and in a bowl combine them well with the almonds, the hazelnuts, and the onion. In a 1-quart jar with a tight-fitting lid pack decoratively the olive mixture, the sliced onion, and the lemon and add the the vinegar, and the oil to taste. Seal the jar with the lid, shake the mixture, and chill it, shaking it daily, for 3 days. The marinated olive mixture keeps, covered and chilled, for 3 months. It also make a great gift.